Hi everyone! It's Cassie here and I have a fun wintery card to share with you today! 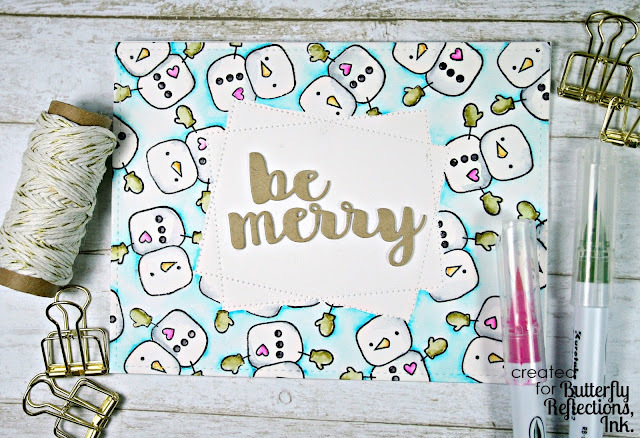 I got these adorable little snowman from Poppy Stamps recently and I've been really excited to use him ever since. Let's take a look at the card! I started making this card by taking a piece of Bristol Smooth cardstock and die cutting the Avery Elle Just a Note die on the front that only pierces little dots into the surface and does not cut the paper. I die cut it twice to make two offset rectangles. Next I stamped the little snowman from the Love Never Melts set all over the card front. I made sure to mask off the area where the rectangles were. Next I die cut the words "be merry" from another Avery Elle die set called Holly Jolly. This set is awesome because it has the cutest font with some interchangeable sentiments. I colored the snowmen in using my Zig Clean Color Real Brush markers. I hope you enjoyed the card today! How many cards do you have made to send out this holiday season? I'm doing pretty good this year, but there is always more to make! :) Thanks for stopping by and I will see you again soon with another card!